our attendees at the Slimbridge Dowsing Group meeting. 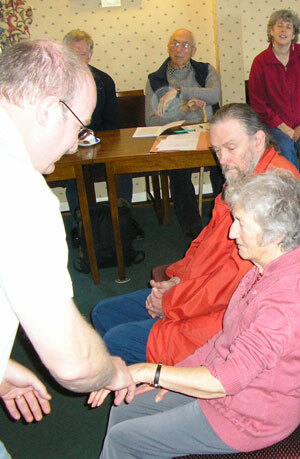 Hypnotherapy was the subject of a talk at our meeting on Saturday morning 22 November. Our members relaxed in the comfortable venue of the Slimbridge Royal British Legion club whilst ex-Navy helicopter instructor Mark Firth, speaking in a deep, soothing voice, and well chosen words, described how hypnosis can be used to help overcome mental and physical disorders. Mark said there was a great similarity with dowsing, and started by asking us to hold our rods or pendulums and consider how we feel when waiting for a dowsing reaction. He said this feeling of detachment and concentration is effectively the same in hypnosis. All hypnosis is self-hypnosis – becoming focused and detached whilst remaining alert. This acts as a tool to access the subconscious mind to accept subtle instructions. Whereas our conscious mind controls many of our activities such as movement, speech, eating, etc., the unconscious mind runs our vital activities such as heartbeat and general maintenance and repair of the body. In the unconscious mind, there is a model of how the body should work – like a designer's blueprint. The unconscious mind will control our involuntary systems to make the necessary adjustments to ensure we function in accordance with that model. Sometimes, when we suffer pain for example, hypnosis can access the subconscious which, by responding to suggestions by the hypnotherapist, can adjust the bodily systems to alleviate this pain. suggestion is, "Stop eating when you’ve had enough!"